We are pleased to announce that Michelle Sundgaard has been chosen to receive the Ohio State Bar Foundation’s District 2 Community Service Award for Attorneys 40 and Under. Michelle practices on the Litigation Team of Pickrel Schaeffer and Ebeling focusing on resolving Business and Landlord/Tenant disputes. She is very active throughout the community serving on the Dayton Children’s Women’s Board, the Dayton History Bell Board, and the Dayton Foundation Disability Board. 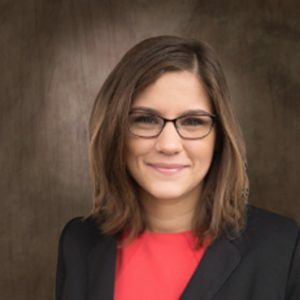 Michelle volunteers her time on a regular basis assisting with the Dayton Bar Association’s Wills for Heroes program, speaking to law students at the University of Dayton, and attending local community charity events. The Community Service Award for Attorneys 40 and Under is presented to attorneys, 40 years of age or younger, who contribute substantial time and effort in service to a local social service or to a local civic, artistic or cultural organization. The service must be outside the recipients’ practice of law and given without compensation. Emphasis is placed on current service. Recipients represent the ideals of the legal profession and, by example, are a credit to the profession.